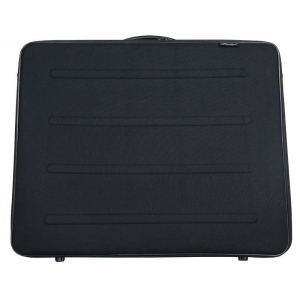 These deluxe portfolios are beautifully crafted as well as durable and functional. 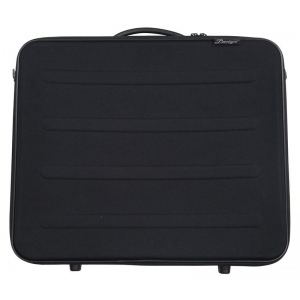 * Constructed with black polyester and an ethylene-vinyl acetate shell the Rugged Pro Deluxe keeps its shape. * A hard plastic frame provides added strength to protect any enclosed artwork or personal items. 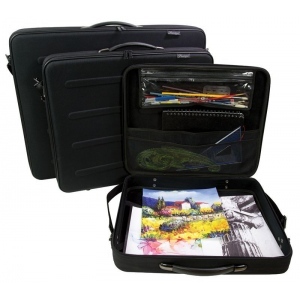 * These portfolios feature a clear zippered pouch a large mesh pocket and adjustable straps to hold artwork in place. * Designed with travel in mind each portfolio has adjustable detachable shoulder straps comfort grip easy carry handles and rubber feet to protect it from wear. The gusset size is 2 1/4".